The BOXX APEXX S-class workstation is driven by the world's fastest professionally overclocked Intel® processors, housed in a variety of chassis. Our advanced liquid cooling design gives you cool, quiet operation while maintaining safe, stable performance with speeds currently up to 5.1GHz. And, depending on configuration options, the S-class supports up to 3 professional GPUs, and it leaves room for massive internal storage potential. BOXX APEXX S-class workstations are designed for creative professionals looking for lightly-threaded performance. Applications such as Revit, AutoCAD, SolidWorks, Inventor and other CAD applications thrive with a higher frequency processor. Pairing overclocked 9th generation Intel Core I7 and I9 processors with advanced liquid cooling allows users to improve their modeling and animation workflows. Learn more about the BOXX APEXX S-class overclocked workstation. Get more information about the unique features of the BOXX APEXX S3 creative professional workstation. The S3 can accommodate up to 3 GPU's, depending on the GPU model. Find out more in this video overview. Lightly threaded 3D content creation tools are limited by the frequency of the processor. A faster CPU clock speed means more creating and less waiting. S-class workstations only use professionally overclocked Intel® processors. See the benchmarks! Let's get you hooked up. Need your APEXX S3 tomorrow? Look for popular configurations in Quick Ship. 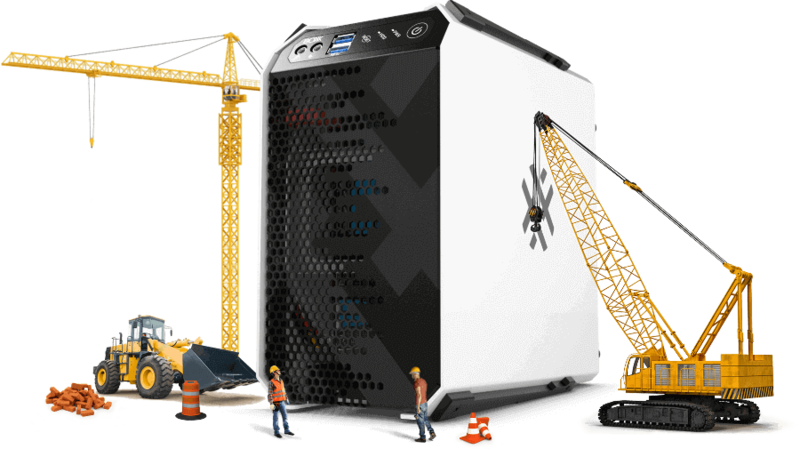 With all the features of an APEXX S3, Enigma accelerates professional CAD and 3D, but as an added bonus, it also delivers optimal support for multi-GPU tasks. Supporting a wider range of GPUs and backed by a 1000 watt power supply, Enigma is configurable with two full-size GPUs and equipped with a chipset that offers full bandwidth dual x16 PCIe lanes (twice as many as S3) accelerating GPU performance and functionality. Configurable with the latest generation Core™ i7/i9 processors with 8 cores, the APEXX S4 is the essential workstation for your professional applications. * Support of 3 GPUs depends on GPU model. Ask a BOXX performance specialist about max GPU configurations and power constraints. Design timelines have compressed significantly in the last twenty years – by up to 50% - and they continue to get shorter. That’s where APEXX S-Class desktop workstations featuring 9th generation Intel® Core™ processors come in. A close look at these benchmarks reveals the distinct advantage 9th generation processors overclocked from 3.6 GHz to up to 5.1 GHz have over previous technology. Stay ahead of deadlines AND your competition with 9th generation Intel Core processors in BOXX's S-Class desktop workstations. Think of the time you’ll save. *OC (Overclocked) - BOXX has been shipping overclocked systems since 2008 and with thousands of systems in use throughout the world, we have not experienced a processor failure rate any different from that of standard processor systems. This is because we work closely with our partner Intel to ensure we stay within the parameters of safe overclocking, providing increased performance without applying significantly larger increases in voltage.